Cheesy Balls and dips are always popular at potlucks and events. But most recipes need a blender or processor, lots of wait time, straining and handling. 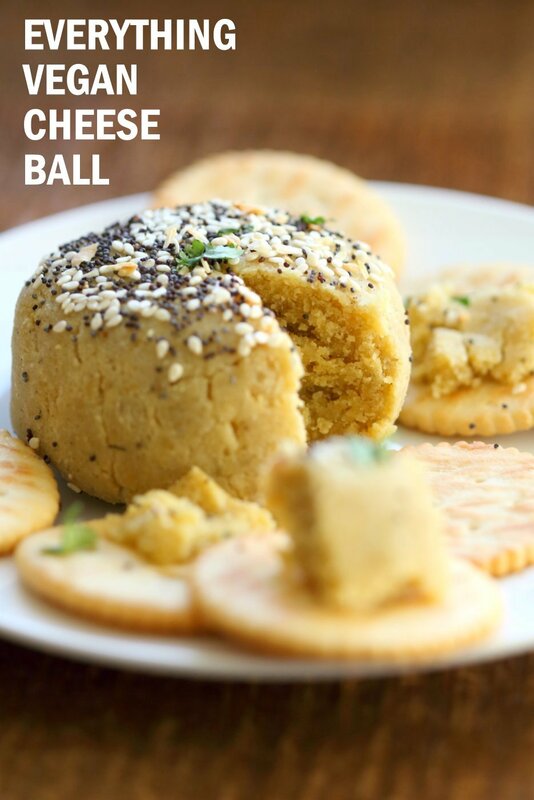 You dont need to do any of that with this cheese ball. It takes just 5 minutes to put together, 35 mins to bake and its ready to serve! Put the almond flour, spices, flavor ingredients in a bowl, mix well to combine, knead for a minute to combine and bring together, done! Roll it in everything bagel seasoning or other spices or seeds /crushed nuts, and bake at low heat. 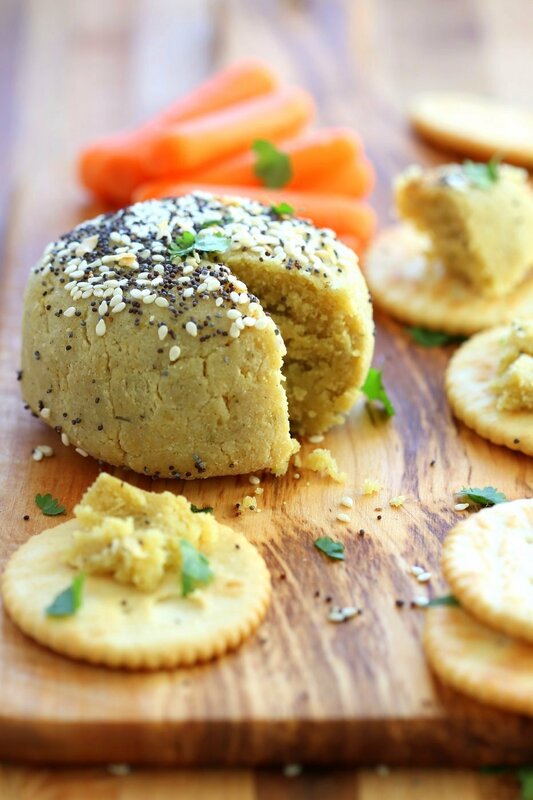 Cool and serve with veggies and crackers. Easy as that. Perfect to start up the Holiday Dinner. Happy Holidays Everyone! Pizza dip with herbed mushrooms, cashew mozzarella cream and veggies. Entree Ideas for Holiday dinners, see here. Amazing, delicious, easy and versatile. Use it instead of feta over pizza or salad! This cheese idea is inspired by elements from Ricki’s Feta and Sophia’s Cashew parm. If you make this recipe, do let me know how it turned out. Tag me on Instagram #veganricha. Add all the dry ingredient to a bowl (almond flour to black pepper) and mix well. Add the rest of the ingredients except bagel seasoning and mix well. Get your hands in there to press and knead into a dough. Taste and add more lime juice if needed. If the mixture is too crumbly, add a few drops of water at a time and press and knead to make a ball..
Brush oil or aquafaba. Roll into everything bagel seasoning or sprinkle some on the ball and pat. Or use a different coating of choice or no coating. Bake at 200 degrees F for 35 to 40 mins. Cool for 10 minutes before serving. Or refrigerate for a few hours for flavor to develop more and serve when needed at room temp. The ball can be stored refrigerated in a closed container for upto 4 days. Variation: Add some fresh dill, or smoked paprika and chopped jalapeno to the cheese for flavor variations. To make into a dip: Add 1 tbsp more non dairy yogurt and some water until it is a creamy consistency. Then bake for 25 to 30 minutes and serve. Richa! This recipe is pure magic. I never thought about starting a cheese with almond flour but it makes so much sense, and cuts down the work and time involved in a massive way. I’m seriously making this ASAP. Its a product of me being lazy 😉 I just didnt want to soak and strain after all the blending :). And then when i tasted it, i was like, why have i been doing all that blending and straining! Not sure why blending and straining were ever thought necessary, vegan cheese is so much easier than that as you saw from my Parmesan! This sounds absolutely delicious, thanks so much for mentioning me as inspiration! Happy holidays sweet friend! I know right. too much handling and planning 🙂 Happy Holidays to you and yours too! I just turned to a vegan diet a month ago and your recipes have made my transition so much easier and yummy! Thank you! Thats awesome that you transitioned to a vegan diet! Good luck! I am so glad to be of help! 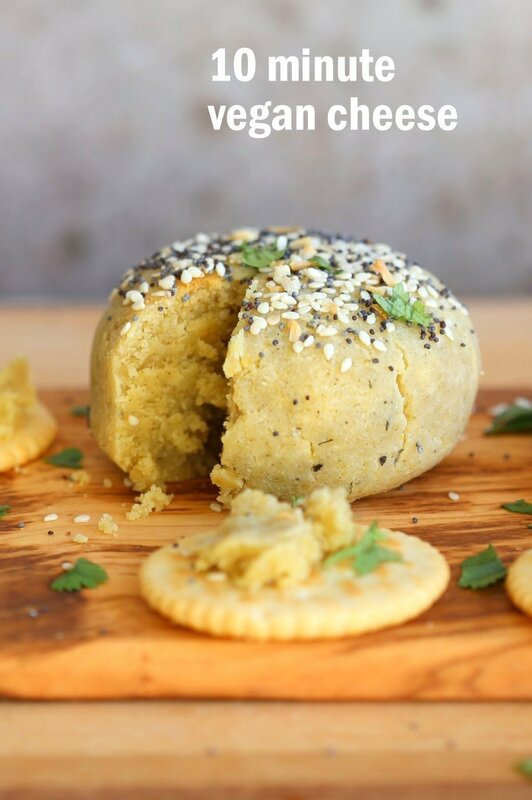 Can I use chickpea flour instead? Can’t wait to try this recipe out! 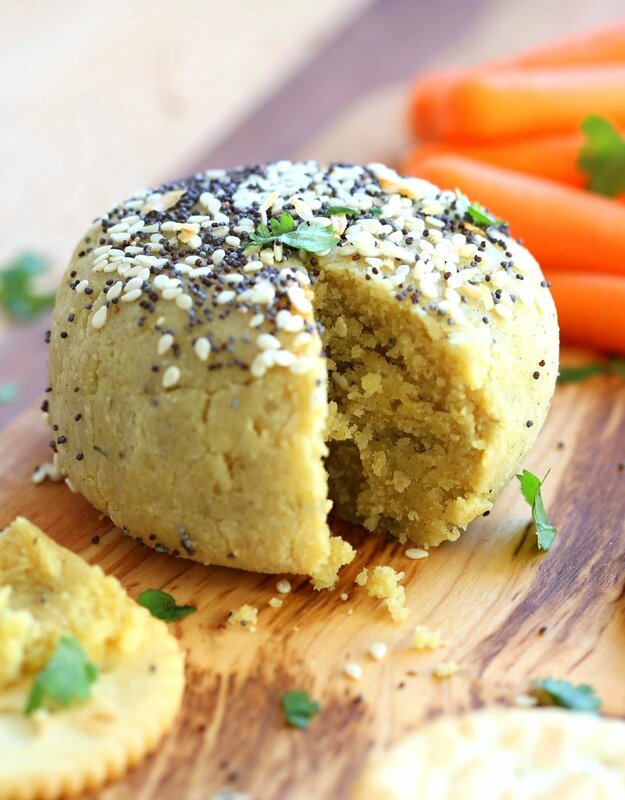 chickpea miso is soyfree miso. If you can’t find it, use more nutritional yeast to taste. This recipe sounds great. But as I was reading through it, I realized I’m not sure when to add the miso? I love miso, and I don’t want to leave it out. Thanks so much for all of your creative and delicious recipes. You are a true inspiration. with the wet ingredients. It gets mixed in while you are kneading. Do you think I can sub sunflower seeds to make it nutfree? I havent tried them, but they might work. Powder them and try with 1-2 tbsp to test first. Amazing flavor! 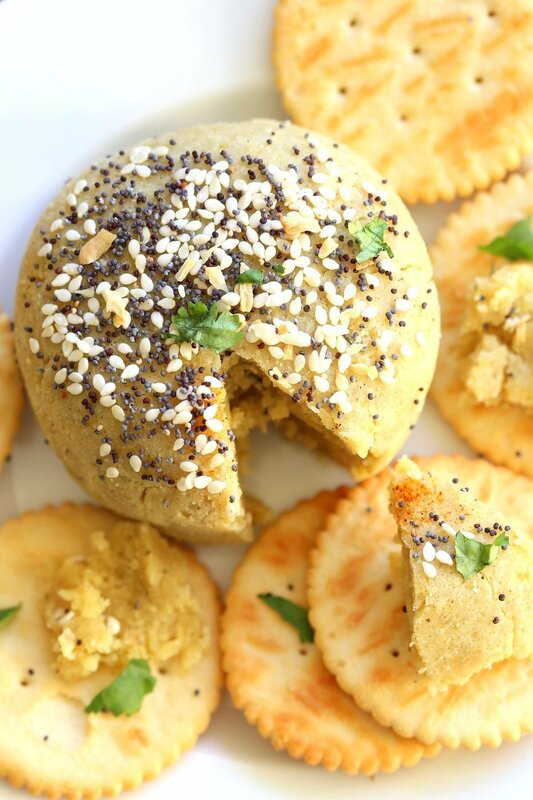 I think it works even better as a crumbly parmesan substitute than a cracker spread. It totally does. The cheese softer and cohesive depending on the almond flour, moisture content and kneading. However the texture, it tastes great! This was delicious! I made this today (doubled the miso and the garlic) and instead of onion flakes I used dried shallots. I baked it in my dehydrator for about 6 hours (then refrigerated it). The cheese ball was a big hit with my non-vegan guests. Thanks for your brilliant ideas! Delicious! Gets better over time for sure. Wonderful substitute for dairy cheese. Haven’t had cheese and crackers for so long! This looks amazing! Your recipes are the best out there!! can I use coconut flour instead of almond flour in this recipe? Thank you! I made this for my 8 yo daughter who is allergic to dairy yesterday. She loved it and she would have eaten the whole thing in one sitting if I hadn’t stopped her. Thanks so much! Your recipes make my life so much easier. I can’t tell you how excited I am to try this recipe! Do you know if there is a good substitute for the nutritional yeast? I don’t do well with yeasts and many plant based recipes recommend it. Any suggestion is greatly appreciated! Add more miso and ground mustard. that should add a good cheesy profile. You can taste before baking since everything is edible in the mix. Just made this for dinner tonight – the family slowed down eating it once I told them it was 650 calories 😉 but it was still gone in no time. We need to come up with our own vegan titles for our mock cheese and else. This “fill in the name” was very tasty and I can see it going well with a cracker, but if I would call it “cheese” for an omnivore I would have to face heavy criticism. Thank you for the recipe, we will be making this again, and next time we will let it sit, to develop the flavor. Thats true. Right now everyone searches for vegan “cheese” or whatever vegan something. Until there is a consensus, its hard to come up with my own name else no one will find these amazing recipes! you can leave the mixture as is in the fridge to chill for a few hours and it will set. I like the baked version as the flavors meld and get stronger. Hi Richa! I just wanted to let you know my very Western Doctor went Vegan about 3 years ago and he’s a changed doctor. He is so much more in tune with food as healer. I went to see him for some inflammation I was having about a month ago and he recommended you to me (I’m vegetarian). Well I’m now into a month off of all dairy and my inflammation is all but gone, but I really do miss cheese. Thanks for sharing this and all your wonderful recipes! Taste amazing!! Thanks for the recipe !!! I tried the vegan yogurt variation to make it more of a dip and it turned out AMAZING! Thank you as always for your amazing recipe! I’m not sure if I need to add the oil in, or just use it to brush on before rolling in seasoning. Please advise. Can’t wait to try this!